I thought it might be a good idea to let all of my bagpiping and drumming blog followers know that the ‘Our Journey’ book is now officially a limited edition collectors item. The book, a first of its kind in the pipe band world, features personal and emotional stories from some of the greatest ever bagpipers, drummers and drum majors. The pipe band world is such a small fraternity yet we know so little about the upbringing of our pipe band ‘idols’. Not only are the stories intriguing but they are accompanied by some of the most amazing photography – thanks to Ryan MacDonald, Weatherly Schiele, Derek Maxwell and a handful of others. However, we have decided that instead of reprinting the book, we are going to leave it as a collectors item – limited edition. Pipers and drummers throughout the World have been grabbing their copies since its launch at the Piping Live Festival at the National Piping Centre. You can get your copy directly from the Our Journey website. Want your copy? Please get it before they all sell out. No further copies will be printed. One of the most valuable educational resources for pipe band drumming has to be YouTube. In the past 5 years, Pipe band YouTube clips have increased in popularity and frequency. I have to admit, back when I was a young lad in the late 1990’s , I would have given anything to access a resource like YouTube. I recall walking around the contest park with an old cassette recorder. I’d bring 5 cassette tapes with me and record as much as possible in audio format. These recordings were extremely valuable to me and shaped my learning hugely. Recordings of the SFU drum corps, RUC drum corps, the Field Marshal Montgomery drum corps and of course Jim Kilpatrick’s, Shotts and Dykehead drum corps were amongst my favourites. I developed a passion for transcribing the recordings, or at least the most intriguing ones. The Northern Ireland Piping and Drumming School provided me with the skills and knowledge to listen to the music and put it down on paper, I have Sam and Gavin Bailie to thank for that. Listening to the cassette recordings allowed me to hear the passion and expression in the music. I clearly couldn’t play the stuff but I certainly made an attempt at it and that process certainly shaped my direction in terms of musicality. Pipe Band Drummers have an AMAZING resource at their fingertips now – YOUTUBE! There are literally 100’s of pipe band drumming videos, scottish drumming clips and all sorts of demos. Just type in pipe band drumming, and you will be blown away with the top quality resources. Simply watching these clips will provide you with top notch passive sub-conscious learning. Just looking and listening will help you to develop your pipe band drumming skills. I have to recommend a few specific scottish drumming videos that I believe will help you to develop your skills. If you take a look at the pipe band drumming clips above, and decide you can’t learn anything then I suggest you question yourself! I personally learn something new every time I watch Jim Kilpatrick perform! Use this great FREE pipe band drumming resource, and learn from the best! March 14th 2013 – Tyler Fry announced and launched is long awaited Tenor Drum mallet. The TyFry Ultimate tenor drum mallet heralds a new dawn for pipe band tenor drumming. The Ultimate is the world’s lightest, most aerodynamic tenor drum mallet and features groundbreaking permaTONE™ head technology designed to produce improved response and control with less effort. Built around a sleek graphite metallic injection moulded high strength shaft, the TyFry Ultimate is finished with a synthetic fur (every colour you could hope for!) covered integrated heads and supplied with high quality colour-coded flourish cords. Check out the TyFry Tenor Drum Mallet at Come2Drum.com and get your very own pair! Jim Kilpatrick, Tyler Fry, Richard Hawke, James Laughlin, Stuart Liddell, Greg Wilson, Grant Cassidy & Kyle Warren are the tutors at the World Masters Pipe Band Workshop in Christchurch, New Zealand. This 3 day workshop, 28th Sept 2012 – 30th Sept 2012, gives participants the opportunity of a lifetime to meet and learn from tutors who have collectively won 60 World Championship titles. Jim Kilpatrick MBE will be heading the drumming faculty, a World Solo Drumming Champion (many times over), the current Leading Drummer of the World Champion Drum Corps, Shotts and Dykehead Pipe Band and the most decorated pipe band drummer in the World. Not only will the participants enjoy World Class tutoring, they will also get to see all of the tutors perform in a concert along with the Canterbury Caledonian, New Zealand Champion Grade 1 Pipe Band. To add another dimension to the 3 day workshop, Jim Kilpatrick and Tyler Fry will be hosting the first ever “Drumming For Drinks” contest – a world famous drumming event. To register or get more information please visit the Official World Masters Pipe Band Workshop website. Well, today kicked off the New Zealand National Summer school in Christchurch. 200+ students from all over New Zealand & Australia have travelled to Christchurch for the annual week-long piping and drumming school. Tutors Jack Lee, Reid Maxwell, Richard Hawke, Tyler Fry, James Laughlin, Scott Birrell and many other top tutors are providing the instruction for the week. The students will be treated to an instructor recital this evening, lots of great talent in one room should make for an awesome night. It is very refreshing to see so many excited students ready to play drums for a whole week!!! Come2Drum offers the Worlds most comprehensive educational package for Scottish Snare Drumming. If you want to learn Scottish Drumming, become a drummer in a pipe band or just simply challenge your personal rudiment skills, then you should check out Come2Drum. The past few months in the pipe band world…. I thought I might give you guys a wee insight to the past few months, and some of the exciting things that have been going on! August – I went to Scotland for the World Pipe Band Championships and also attended a few other highland games whilst I was there. Canterbury Caledonian Pipe Band, the band I am part of, ventured on the long journey to Scotland for a second year running. September – Drumming Workshops in Noosa and Canberra were on the cards in September, alongside Jim Kilpatrick, Tyler Fry, Jori Chisholm and many others! October – I am the luckiest man on earth, as I married Lisa Campbell. Currently I am in Scotland, rehearsing for the World Solo drumming championships this Saturday. It will be great to play a tune or two and also catch up with all of my pipe band drumming buddies…. Check out the pipe band drumming Book series!!!! Well, it happened again….only it was even bigger and better than ever. The Canberra College of Piping and Drumming hosted their annual Workshop for bagpipers and drummers. This special event brought in players from all over Australia, U.K and New Zealand. The Worlds top piping and drumming experts offered their advice, skills and knowledge. The teaching line-up included Jim Kilpatrick, Tyler Fry, Jori Chisholm, Greg Wilson, Stuart Liddell, James Laughlin, Brenton Earl, Richard Hawke, Grant Cassidy and Ken Maltman. Pipe Band drumming lessons were offered to students of all levels. People arrived, wanting to know how to play the Scottish drums, and they left with all the skills and ability to play the pipe band drum! 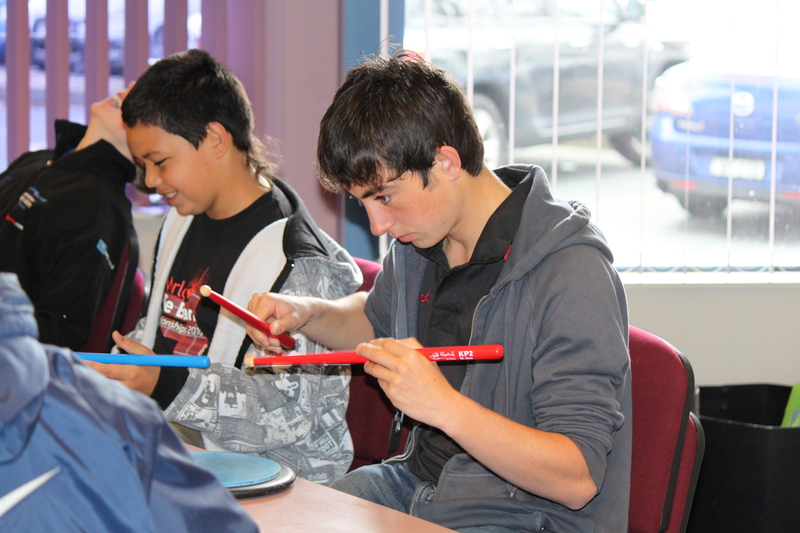 What topics were covered at the pipe band drumming workshop ? James Laughlin released his new book, Learn Pipe Band Drumming Volume 2, at the Canberra piping and drumming workshop. You can get your hands on a copy here. If you are just starting to learn pipe band drumming, then James Laughlins Guide to Pipe Band Drumming Volume 1 would be the best option for you! Don’t forget to check out the C2D Studio – the worlds first and only digital scottish drumming studio.